There isn’t an issue in the news that doesn’t have some band of left-wing mutants marching down the streets screeching some recycled 1960s chant of “Hey, hey, ho, ho! Something or other has got to go.” How do you parody that? Democrats just nominated a rabid socialist over someone who was in line to be their leader in Congress, then the chairman of their party called her the future of it. The only way to parody that is to have a skit with Che Guevara as head of the DNC. The mutant mob calling for the abolition of Immigration and Customs Enforcement (ICE) is one thing. It is also to be expected from those who despise the concept of borders and capitalism. But to have prominent members of Congress and possible presidential nominees publicly jump on board is beyond parody, it’s pandering from behind. Saturday Night Live couldn’t mock a mockery like that if it wanted to, the real thing beats them to the punch at every turn. 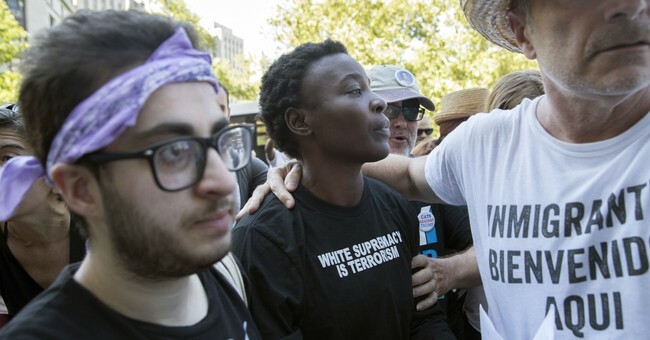 By the time they could even think to write a sketch about how an immigrant from a war-torn hell hole like the Congo climbed the Statue of Liberty to protest enforcing immigration laws then praised former First Lady Michelle Obama while wearing a “white supremacy is terrorism” t-shirt, it actually happened in real life…on the 4th of July, no less. This skit would cause normal people to ask questions, like if you think this country is so awful why would you choose come here? But the radical left are not normal people. They cheer and nod in unison like a series of bobble-head dolls on the dashboard of a car driving down a dirt road. The Democratic Party has become their fringe. They are beyond parody. Fringe is the edge of something attached to the center of something else, or at least it’s supposed to be. The Democratic Party has no center anymore. This, I suspect, came as a surprise even to its former leaders. In 2016, the party really thought Hillary Clinton would win the nomination in a walk, but she barely won it in a stumble and the party needed to cheat to even do that. Socialist Bernie Sanders exposed just how far left the Democratic Party had gone and how large the fringe had become. The idea that Ronald Reagan wouldn’t be conservative enough to win the GOP nomination is a popular trope in liberal media circles because the party has “moved so far to the right.” But it is the Democrats who wouldn’t nominate someone like Bill Clinton. JFK would be chased out their convention if he simply tried to speak today. It’s not Republicans who’ve shifted to the right, Democrats have moved so far to the left that everything else seems like it ran away. The American people are running away. A decade of electoral losses have exposed just how far liberals will go to regain grip on the levers of power. Calls to impeach the President for existing in opposition to them and to pack the Supreme Court are just the beginning. To get what they want they will grant citizenship to millions of illegal aliens and flip the Constitution from a document that limits the power of government to infringe upon fundamental right with which we were born to an irrelevant piece of parchment bastardized to empower the government to grant rights. And if a government can grant rights, it can also repeal them. And that the left’s ultimate goal – to turn our system of rights on its head so they are the arbiters of who can do what. Barack Obama exposed it when he said he wanted to “fundamentally transform the country.” You don’t seek to fundamentally transform someone or something you love. To get to that point they will continue down the dangerous path of driving their angry mob, of emotional manipulation through any and all means. No matter who President Trump nominates for the Supreme Court Monday, no matter how true to the Constitution they are, November matters. Every November will matter. The protests, the marches, the riots, the Hitler analogies, the lies, the…rage will continue. And worse. What starts with someone ripping the “Make America Great Again” hat off a kid and tossing a drink in his face can’t end anyplace good. If you don’t toe the liberal line, be careful and, most importantly, stay vigilant and vote. While the left will do anything to win, the best way to beat them is to keep them from their goal. Post Script: I’ve written a book on this very subject, Outrage, INC: How the Liberal Mob Ruined Science, Journalism, and Hollywood, on how the liberal mob mentality works. How the left uses institutions, once trusted and loved, to manipulate and motivate the vulnerable. Find out how it works and protect yourself from their subtler methods. It’s packed with research and, in spite of the tone of this particular piece, a lot of humor. People tend to remember things if they’re associated with humor – I bet you remember more jokes and fun times from when you were a kid than lessons from elementary school. Anyway, I’d really appreciate it if you’d pick up a copy, not just because it would allow me to write another one, but because it’s a damn good book. Check out this interview I did with Stefan Molyneux on the book, it fun and informative. Then pick up a copy for yourself so you can help others with their deprogramming and open their eyes.